Symecord is a type of tablature and notation combined. Regular guitar tab has a horizontal time axis, no pitch axis, rows for strings, and frets indicated numerically. 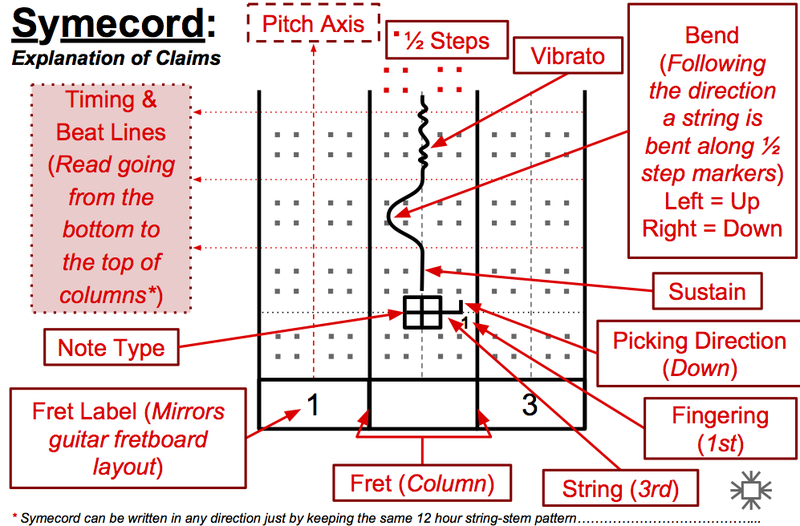 Symecord has a vertical time axis with a multi-pitch axis for each activated position inside each fret-column, strings are indicated following a 12-hour clock pattern and other details are shown symbolically & numerically. In the vertical layout, the y-axis shows the passage of time measured across beats. The x-axis shows activated positions divided into columns mirroring the fretboard layout. Each fret-column has a pitch axis that measures variations with-in that position out to half step points indicated by hash marks. Natural harmonics are designated at the appropriate spots over fret-column borders that are in essence the fret ridges. Symecord is a portmanteau combining; symbol, symmetry, system, metered, chord, coordinates. Symbols are used to represent note types. Symmetry exists between the instrument layout and notation presentation. The system is comprised of a coordinate plane on which music is graphed along a multi-axis pitch board. A metered timing scale is used to show rhythm. Chords of interconnected sound waves join pitch points along a curve. Notation is coordinated graphically and proportionately represents the physical actions required to play.